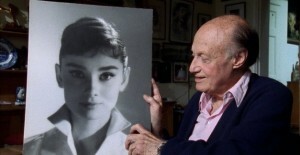 Jack Cardiff talks Audrey Hepburn in Cameraman. A first rate tribute to the late, great Academy Award-winning cinematographer Jack Cardiff (who died in 2009 at the age of 94), Cameraman: The Life and Work of Jack Cardiff isn’t stingy in the vintage stills or film clips department. And that’s a good thing, because gazing at portraits of such beautiful actresses as Sophia Loren, Marilyn Monroe and Audrey Hepburn and watching snippets from such Technicolor film classics as Michael Powell‘s The Red Shoes and Black Narcissus, John Huston’s The African Queen and even Rambo: First Blood Part II isn’t such a bad way to spend an hour-and-a-half. Cardiff’s 80-year career is jauntily detailed via the aforementioned clips and stills, along with interviews with the man (many by filmmaker Craig McCall conducted the year before Cardiff died, others from previous years), chats with a handful of living collaborators and praises sung by a slew of fellow filmmakers including Alan Parker (Midnight Express) and Richard Fleischer (Tora! Tora! Tora!). Martin Scorsese (Shutter Island) is also onboard to wax over Cardiff’s career (particularly the films he shot for Powell), but that’s no surprise as Scorsese never misses an opportunity to appear in a documentary about the history of cinema. The bonus features on the DVD are a varied lot and include an enlightening lesson in the Technicolor process and 10 minutes off Cardiff’s home movies, many of them shot behind-the-scenes of the production of The African Queen (Bogie and Katharine Hepburn look fantastic). There’s also a gallery of the many photographic portraits he made of the leading ladies he shot over the years. Amongst them is the stunning Ava Gardner, who Cardiff recalls used to tell him that he would have to work harder than usual to make her look beautiful on they days she was menstruating. Hurray for Hollywood…!